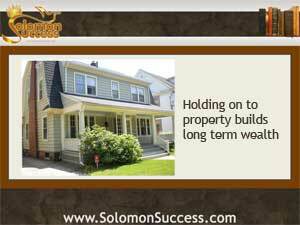 King Solomon advocated a slow and steady approach to crating prosperity. “Go to the ant, o sluggard,” he advises in Proverbs 6:6, because the ant works hard and regularly throughout the seasons to store up needed food. Building wealth in real estate works the same way. House flipping doesn’t build long-term wealth, as a family of “professional” flippers recently found out. A May 2013 story in San Antonio’s online newsmagazine mySan Antonio reports the saga of David and Melina Montelongo, stars of the A&E reality show “Flip This House.” After a much-publicized career spent buying, renovating and quickly selling houses, the family finds itself bankrupt and living in a rental house, their flipping empire in tatters. Flipping houses looks like a fast way to make money in a hot real estate market. The practice itself is legitimate, although some of the tactics involved are not. What typically happens is this: a speculator, or flipper, buys a property, often a fixer upper, and often with cash, does a few fast renovations and rushes it onto the market again. A quick sale later, and the flipper has the money to buy another house, repeating the process as often as they choose. But flipping has its problems. The profits don’t last, and some is lost in transaction fees and renovation expenses. Because flippers don’t hold onto the properties they buy for very long, there’s no chance to accrue equity or even to reap long-term profits from rental income. And as the flipper does transaction after transaction, the profit margin can shrink. Lucin, Valentine. “Financial Roof Falls In On Pair of House Flippers.” MySanAntonio Business. MySanAntonio.com. 30 May 2013.